Zhao Tao as Tao and Yi Zhang as Jinsheng in Jia Zhangke’s Mountains May Depart, 2015. This piece was first published on the NYR Daily on February 17, 2016. Chinese director Jia Zhangke’s new movie, Mountains May Depart, begins with a disco dance in a bleak mining town to the sounds of “Go West” by the Pet Shop Boys. It is the lunar New Year, 1999. Outside, the end of the millennium is celebrated in a more traditional style with exploding firecrackers and dragon dances. China’s breakneck transition from Chairman Mao’s impoverished, isolated, regimented hecatomb to a world of disco music, mobile phones, German cars, Cantonese pop, and vast individual wealth is as explosive as those firecrackers shattering the cold air of the northern plains, where Jia himself was born. 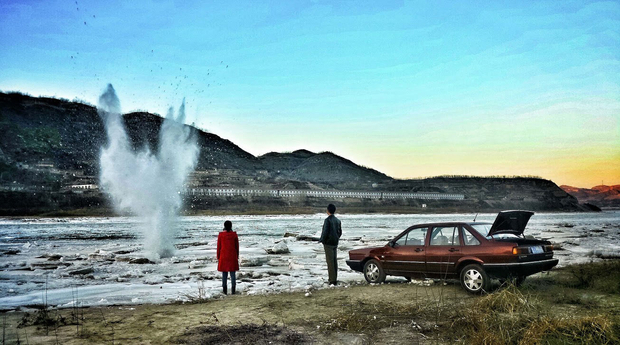 One of the explosions in Mountains May Depart starts with the main character, Tao (played by Jia’s wife and frequent collaborator, Zhao Tao), a bouncy young woman caught in a love triangle, walking along the local river, which is still beautiful but would soon be threatened by a gigantic dam. Suddenly we hear the roar of a light aircraft streaking over her head before crashing in a ball of fire, rather like those earlier fireworks. Tao seems unfazed. She simply walks on. The crash appears to have no particular significance. It has nothing to do with the story of a provincial woman and her two suitors. If the crash is a metaphor for China’s madcap development, it is not emphasized. Jia has an instinctive feel for China’s shifting rural and urban landscape, so brilliantly expressed in earlier films, like A Touch of Sin (2013). He is superb at catching the changing moods of his country in poetic, frequently wordless, and often absurd images. These scenes are not conventionally beautiful, let alone pretty: he can make industrial smoke stacks, a provincial railway station, or a coalmine, look stunning. Jia has done for Chinese film what Alain Resnais or Robert Bresson did for French cinema, with their genius for the quiet transcendent moment (think of the dying donkey in Bresson’s Au hasard Balthazar). Jia does not bang his points home, any more than they did. Yet the scene of the plane crash as Tao walks by is unforgettable. Mountains May Depart divides Tao’s life—and by extension the life of China—into three episodes. The first part of the movie is set in 1999, the second in 2014, and the third in 2025, this time in Australia. In the first part, we meet Tao, whose family runs an appliance store, and the two local men, Jinsheng and Liangzi, who are courting her. They represent different faces of modern China. Liangzi is a man rooted in his rural community, a miner traditional in his habits; we see him praying to a folk deity in front of a family altar. Jinsheng is all get-up-and-go, a showy entrepreneur, impatient to grab the new riches available in post-Mao China. He buys a bright red European car before he can even drive it properly. He buys the local coal mine where Liangzhi works, and fires him when Liangzhi refuses to stay away from Tao. But he wants more, and more, and more. Jinsheng’s aspirations to join the “elite” seem slightly absurd to Tao, but eventually she chooses him to be her husband. They have a child. He insists that the boy should be named Dollar, after all the dollars his father will make. In the second part, 15 years later, Tao and Jinsheng are divorced. Jinsheng has now moved to Shanghai, where Dollar attends the International School. Still in her hometown, which she will never leave, Tao has lost custody of the child. Liangzi, the rejected suitor, has moved to a different town, where he falls seriously ill, without enough money to pay for proper medical care. Swallowing his pride, he turns to Tao for help. If the heady atmosphere of 1999 is expressed in the catchy Pet Shop Boys’ tune, the more melancholy, even disillusioned air of 2014 is conveyed by a sentimental Cantonese pop song, first heard years earlier on a cassette tape in Tao’s family store. The song is repeated when Tao and Dollar sit side by side on a slow train back to his father’s home in Shanghai. Dollar has visited his mother to attend his grandfather’s funeral. The provincial town where he was born is alien to him now after the metropolitan luster of Shanghai. Tao knows that she will probably never see her son again. Their bond, not yet grasped by the young boy, is illustrated by the kind of wordless scene in which Jia excels. They sit together, silently, sharing the earphones plugged into an iPod. A close-up of Tao’s face shows you all you need to know about loss and motherly love. The intimacy Dollar had once unconsciously enjoyed with his mother is strangely reenacted with the teacher from Hong Kong. While driving together through bland Australian suburbs, she plays a CD of a Cantonese pop song. Dollar has a sense of déjà vu, but doesn’t know why. They end up in a hotel, sleeping together, talking about his lost mother in China, and hers in Toronto, about loneliness, and the need to forget the past. The teacher encourages Dollar to return to China and visit his mother. She is on the verge of buying airline tickets for the two of them. But he cannot bring himself to go. The past is a lost country. Some of the absurdist, seemingly meaningless images that we see in the first two episodes come back: a Chinese man carrying a traditional halberd, like an actor from a Chinese opera who has lost his way. The sense of dislocation is clear. And yet the third part of the triptych doesn’t quite work. Now that the script is in English, the film becomes oddly wordy. Clunky statements about life abound: “The hardest thing about love is caring,” and so on. At the end of the movie, we see Tao once again, an old lady now, living alone, cutting up meat in her kitchen to stuff into her famous dumplings, as she had done before, first for her two boyfriends, and then for Dollar in 2014. She steps outside into the snow, to the river, now dammed up, and begins to dance, on her own, snow falling all around her, to the sounds of “Go West,” as the town pagoda looms up behind her. It is a wonderful image that reminded me of many Japanese films made during Japan’s fizzing economic boom of the 1960s and 1970s, films like Shohei Imamura’s Insect Woman. No matter how much the world changes, women are survivors, their vitality undiminished, even as everything else, including the men who depend on their love, come crashing down around them.